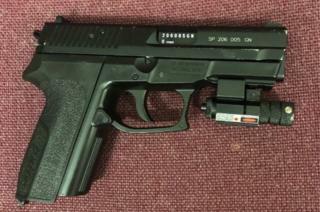 Armed police seized a BB gun from an eight-year-old boy who had taken it to his primary school. Lancashire Police said the "surprisingly powerful" gun had been given to the boy as a birthday present by his father. BB guns - airguns that fire small pellets - can cause serious injuries. The police firearms team was called to the school in Great Harwood at 14:20 BST on Monday after a member of staff found the gun. Police tweeted they would be speaking to the boy's father. "We don't want items like this in our schools," the force said. They said the gun would be destroyed and the father would "be given words of advice". Police have declined to name the school concerned.